Posted October 10, 2018 by Georgia Fullerton & filed under City Hub. At 9 am on Tuesday the 9th October 2018 the Parliamentary Inquiry into WestConnex opened. This is the inquiry that Glad the Impaler did her damndest to prevent. Following glowing reports from the RMS and The Treasury, the Rozelle community was then given an opportunity to speak. The three minute address, which was all I was permitted, read as follows. ‘In spite of the evidence that you’ve just heard, the truth is WestConnex is the southern hemisphere’s biggest preventable unnatural disaster! A catastrophe from every conceivable point of view. It is a massive waste of taxpayer funds. Experts agree it will only worsen Sydney’s traffic congestion. Both the benefit cost ratio and the construction cost have been grossly misrepresented with the true cost estimated independently by SGS Economics at $45 billion! There has been no governance! Had there been, AECOM would certainly have been barred from the project. 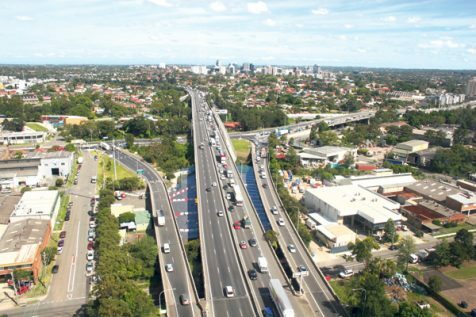 Not only because of investigations into corruption with their overseas dealings, but due to their appalling track record in relation to the business cases prepared for the failed Lane Cove Tunnel, the Clem 7 Tunnel in Brisbane and the Cross City Tunnel here. These bankruptcies have involved staggering sums, with the costs subsequently borne by the taxpayer. In NSW, over $1 billion has been paid to the operator of the Sydney Harbour Tunnel because of the failure to attract the patronage projected in the business case. If the Government wasn’t aware of AECOM’s abysmal track record, this establishes a prima facie case of gross incompetence. If they were, then the Government was obviously seeking a company ready and willing to prepare a (word deleted on legal advice) benefit/cost ratio. Either incompetence or corruption. There is no other possible conclusion. Any contract that guarantees to reimburse the operators for less than projected usage, or that precludes an alternate or competing transport corridor, is definitely not in the public interest. LA’s 8 hours of bumper to bumper traffic in peak periods has convinced legislators there to finally stand up to the fossil fuel lobby, to abandon the freeway approach and to invest heavily in public transport. Rozelle’s four unfiltered exhaust stacks and tunnel portals will make the White Bay region the most heavily, intentionally polluted area in Sydney, if not in the entire country. In excess of 50 tonnes of carcinogenic particulate material will be imported from St Peters, Cammeray and Five Dock, released above Rozelle and will precipitate over us and the adjoining suburbs, each and every year. The NSW Government is knowingly ignoring world’s best practice. The Premier is well aware of this and said so in the NSW Parliament in 2008. Costs resulting from the induced and preventable morbidity and premature deaths will run into $billions. She knows this and yet turns a blind eye. In conclusion, RAW requests that this Inquiry adopts the ten recommendations on the final page of our submission. The principal of these being that a Royal Commission be convened into WestConnex and that no further contracts be signed until the Commission has tabled its findings. I’d have liked to have added so very much more. The way that Sydney’s least affluent demographic will bear the brunt of the $45 billion cost of the tunnels. How homes have been stolen for as little as 60 cents in the dollar. How cancer clusters will develop in Rozelle, Balmain, Annandale and Lilyfield and all of the adjoining suburbs. I’d really loved to have put the boot into Glad for her unashamed attack on the residents of the Inner West. How she can’t claim ignorance of the effects of the unfiltered stacks, that thousands of people will die prematurely – and that their blood is on her hands. I’d liked to have said that the SMC and the RMS were unable to name even one expert in transport analysis or traffic management who was prepared to publically debate the merits of WestConnex. How Peter Jones – the Project Manager for Stage 3 – threatened a walkout at the Balmain Town Hall in 2016 unless he was given the floor unopposed. How the Community Information sessions were really just a sick joke, nothing more than a cynical box ticking exercise with all of the 13, 000 objections simply ignored. How the savings in travel time are an illusion. That those who sit idling in the tunnels as they crawl toward the exit portals are absorbing carcinogens at well over 50 times the maximum dose. That this travesty is only proceeding because both major parties are in the thrall of the fossil fuel lobby and are hooked on their political donations – along with the promise of sinecures for the ‘good little boys’ and girls’ who get into bed with these multinational companies. Sad really. So much to put right. So little time.